What is the birthstone for August? The question is in fact more properly asked, what are the birthstones for August? The month of August has two birthstones; the peridot and the sardonyx. Both of these stones have been seen throughout history and have rich symbolism. The two birthstones are quite different, both in terms of quality and substance. Formerly known as chrysolite, peridot is the modern birthstone for August. Before peridot was the main zodiac stone for Libra, which falls partly in the month following August. Peridot is a transparent olive green stone, sometimes drawing very close to yellow. The color of the August birthstone ranges from lime green to olive green, dark green and yellowish green. Chrysolite is the golden yellow variant of Peridot. The birthstone is believed to heal the lungs, spleen, intestines, lymph and breast of ailments. Amulets with Peridot stones are known to be an effective remedy for Asthma, Sinus, thyroid, eye and liver infections. These stones are known also to alleviate depression, anger, stress, jealousy and other negative emotions. The August birthstone enhances confidence and self-esteem in wearers. The stone is known to be rejuvenating and invigorating promoting clarity of thought. Sardonyx is the variety of onyx where the black bands are replaced by red, which is composed of sard or dark carnelian, hence the name sard-onyx. This stone for August is indeed an agate of white and red stripes. Both the peridot and the sardonyx make lovely jewelry although their effects are very different. The crystal look of the peridot gives off a more elegant vibe while the matte sardonyx has more of an earthy and rustic feel to it. The vast difference between the two stones provides a wide range of jewelry options for those searching for August birthstone jewelry. 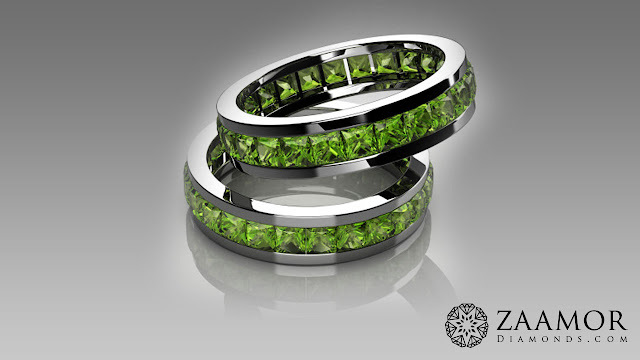 Other stones such as diamonds and tanzanite stones can be terrific additions to these gems, especially to the peridot. Though the peridot and sardonyx are not as popular as other birthstones such as diamonds, pearls, emeralds, rubies, and even amethysts and tanzanite gems, they are beautiful stones that are delightful to incorporate in birthstone jewelry. These stones may look similar to other gemstone such as emeralds and colored diamonds, but there are qualities that are exclusive to peridot and sardonyx stones, which make them unique and extraordinary stones.